Once again, the police are at the center of the nation’s attention. Plagued by daily episodes of needless deaths and brutality, the police are under increasing pressure to “reform” themselves. But as crazy as this might sound to some, the problem is not police – they’re only people, just like everyone else. The problem is policing itself. The only way to “reform the police” is to eliminate policing itself…decriminalize all malum prohibitum “crimes” and just do away with them. Even now, I do not know for certain why I was left trapped in that door by my fellow police officers. But the Narcotics division was rotten to the core, with many guys taking money from the very drug dealers they were supposed to bust. I had refused to take bribes and had testified against my fellow officers. Police make up a peculiar subculture in society. More often than not they have their own moral code of behavior, an “us against them” attitude, enforced by a Blue Wall of Silence. It’s their version of the Mafia’s omerta. Speak out, and you’re no longer “one of us.” You’re one of “them.” And as James Fyfe, [wrote] in his 1993 book about this issue, Above The Law, officers who break the code sometimes won’t be helped in emergency situations, as I wasn’t. This is the story of Frank Serpico, a New York City cop, abandoned by his fellow officers after being shot in the face during a drug bust gone bad, decades ago. He was persona non grata for ratting out his fellow officers on the take. He still is, forty years later. That’s a lot of money, and even more resentment. Money has always been the problem. It was back then, and it is today. Police are people too, and if it weren’t for money in society, constantly being hoarded by the most selfish few, society wouldn’t even need police. [T]oday the Blue Wall of Silence endures in towns and cities across America. Whistleblowers in police departments — or as I like to call them, “lamp lighters,” after Paul Revere — are still turned into permanent pariahs. The complaint I continue to hear is that when they try to bring injustice to light they are told by government officials: “We can’t afford a scandal; it would undermine public confidence in our police.” That confidence, I dare say, is already seriously undermined. Obviously, it’s not public confidence they want to save, but the opportunity to go on making millions undisturbed and undetected. But that is beside the point. The fact that police exist means “public confidence” is already undermined. 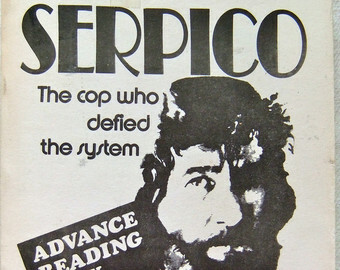 Serpico seems to think that corruption is not as bad today as it was back then. The days when I served and you could get away with anything, when cops were better at accounting than at law enforcement — keeping meticulous records of the people they were shaking down, stealing drugs and money from dealers on a regular basis — all that no longer exists as systematically as it once did, though it certainly does in some places. Times have changed. It’s harder to be a venal cop these days. Maybe so, but as in any other field of business, as the industry matures, slowly but surely, competition is all but eliminated. If corruption is less apparent today, it’s only because control over it has simply moved higher up the ladder, not only making it harder for every day police officers to engage in it, but also to detect it. So while it might appear at first glance that the situation has improved, it has only become more and more exclusive and entrenched, less and less accountable. But, among the rank and file, where bribery and corruption were once rampant, violence and brutality have now taken its place. Serpico thinks it’s for the same reason — lack of accountability. But this is where he and I part ways. Accountability is only part of the problem. While important, accountability provides justice for only those with a name and a face, while the impetus and source of the problem at large remains firmly in place. Moreover, creating “an atmosphere where the crooked cop fears the honest cop” is the wrong way to approach it. it creates fear and mistrust. It’s never worked in society at large, there is no reason to expect it to work among police. The police, like everyone else, are forced to make a living in an increasingly difficult economy. But unlike other segments of society, police are under ever increasing pressure to perform under the most dangerous of circumstances. This puts them under extraordinary pressure, often beyond that which the average person can take. On top of it all, they are armed and dangerous. As awful as it sounds, rampant corruption used to provide some relief from that pressure among the rank and file. With even that gone, anger and frustration is boiling over among police, just as it is on the streets, and for the same apparent reason: lack of money, or to be more accurate – lack of opportunity for a dignified life and a general atmosphere of mistrust. In short, as with every other facet of our society, money is both the root of all evil and the head that reigns over it. We can keep creating layers upon layers of police to police ourselves and each other but nothing will ever change and it will only get worse until we rid ourselves of the cancer in our midst that pits us against each other and against ourselves. As long as self-interest remains everyone’s top priority, no amount of “policing” will ever be enough. The more money we throw at it, the more it will grow. The more layers of people “hired” to combat it, the more layers it infiltrates. Bureaucracy does not cure the disease. It only expands it. Corruption continues to invade every facet of our lives until entire governments are consumed by it. Coupled with greed, upward concentration of power becomes inevitable and lower levels of society begin to feel the wrath of everyone in between. Society begins to disintegrate. Add guns to the mix and you get a powder keg, which as we all know, is disarmed not by “policing” but by defusing. Self-interest (fueled by money) is the fuse. We must get rid of it and end the reign of money over our lives.